Is So Weird going to be the same show when it comes back? This was the question unspoken yet hovering over the show’s return after a month-long Christmas hiatus. The “Fountain”/“Strange Geometry” switch-up left some confused as to whether or not the alluring idea of mother and daughter Phillips finally facing the facts about Rick would be pursued. Is this it? Is this the year that Disney Channel pulls the plug? Not quite. But “Fall” and “Destiny” point to a television series being written for a Disney Channel that will never exist. Of the channel’s most prominent dramas (or dramadies, if you like), In A Heartbeat will premiere in August of 2000 and be surreptitiously phased out by the end of March 2001. The Famous Jett Jackson begins its third and final season in June 2000, soon to be followed up by a Disney Channel Original Movie to wrap up the show. Barely a year after “Fall” airs, Lizzie McGuire will premiere, dominating the channel’s brand identity and solidifying the desire for family comedies over family dramas. In hindsight, then, it makes perfect sense that So Weird decided to press onward with what it was doing. Both “Fall” and “Destiny” deal directly with the consequences of the powerful last moments of “Strange Geometry” and work very well as half-hour episodes of television as well. In the case of “Fall,” those consequences actually play second fiddle to the A-plot of the episode; fortunately, the two stories are connected by a strong theme of guilt. Molly feels guilty for keeping Rick’s love of weird stuff a secret, and although she still insists she was trying to do the right thing, she also concedes that “the right thing may have changed somewhere along the way” and that part of her was just hoping that Fi’s own paranormal investigations would amount to naught. Fi is contemplative, but also diplomatic; she listens to “Another World” again by the pool at the hotel in Missoula, Montana and describes to Molly how she feels like she’s hearing it for the first time, knowing that it’s about more than the love of a family. (“Another World” could be the alternate theme song for So Weird, in that way.) And she’s able to forgive her mother after hearing her heartfelt apology, telling Molly about the list she started of all the qualities other people tell her she shares with Rick. In the last scene of the episode, she gets to add one more: the manic look of passion she gets when trying to convince other people of her supernatural theories. These scenes form the spine of another meaty, melodramatic episode starring Ned Bell. The bus stops in Missoula, which is established as Ned’s childhood hometown. He meets up with an old pal, Sam Hodge, who’s being hounded by a reporter about a fall he took out of the second story of his house earlier that day. Sam and Ned are cagey around the reporter, who starts asking uncomfortable personal questions but leaves on request. Those questions revolve around a childhood tragedy 35 years ago to the day, when Sam and Ned lost their childhood friend, Pete Wills. The story works as a contrast to the Molly/Fi story because of how depressingly passive it is. The rest of the characters (save Jack, who spends the episode with his girlfriend, Gabe) are forced to look on as Sam becomes increasingly possessed by the idea that Pete has come back as a ghost to haunt Sam for being unable to save him on that day. This ultimately culminates in a climactic scene at the river where the accident happened, when the reporter (Lewis Pelt, a name Fi reasons is the grown-up ghost of Pete Wills since the two names are anagrams of each other) hounds Sam in an attempt to get him to spit out the truth. 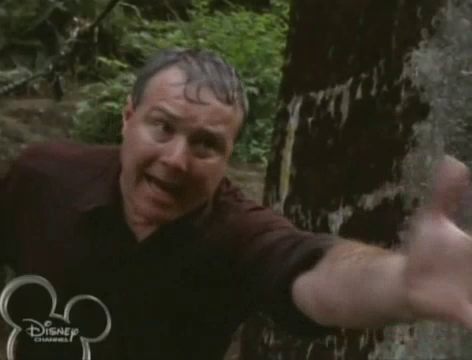 Did Sam really want to save Pete, or did he intentionally let Pete fall to the sharp rocks below? The answer is… a bit complicated. Of course Sam wanted to save his friend, but the fall from the cliffs was scary, and Sam feared for his own life as well as Pete’s. In the end, Pete/Lewis absolves Sam of his guilt for not trying harder to save Pete, but the fear remains, because fear is an eminently powerful force in this world—certainly for So Weird, a show designed on the surface to be a horror show. Fear, then, becomes the driving force of “Destiny.” It’s all over Fi’s face when Ned points out the weird light flying towards the bus. “No, it couldn’t be…” she starts. Yes, it could be, Fi. Bricriu crash-lands into his second episode, this time possessing Molly—who starts the episode with a separate identity crisis, as she’s been accidentally booked with The Moffatts (remember them?) as “Milly Phipps.” Milly Phipps is supposedly a 14-year-old singer-songwriter and not, say, an aging rock star with a bizarre dysfunctional family on a tour bus. It takes a moment for Fi to find Bricriu, as she assumes with good reason that he’s grabbed Jack a second time. Fortunately, the audience can find him faster, thanks to the return of Bricriu’s vain efforts to scratch a human back, made famous by Patrick Levis back in “Will O’ the Wisp” and somehow made even more hilarious by Mackenzie Phillips, who uses the back corner of the tour bus, of all things, to scratch herself. When Fi finally does identify Bricriu (through his use of his favorite moniker for Fi, “little duck”), she’s ready to send him back to the spirit world. But Bricriu stops her, insisting that he’s here in the mortal realm on a “mission of mercy.” Molly is apparently in danger, so Bricriu has taken it upon himself to safeguard her spirit for 24 hours, and vows to depart once the danger is over. Fi’s fear for her mother overrides her fear of the powers of darkness, who are humorless and stuck in a rut of “conquer and subjugate, conquer and subjugate,” according to Bricriu. So basically, “Milly Phipps,” who is actually Molly Phillips, who in turn is being safeguarded by Bricriu’s possession of Molly’s body, performs the opening act for The Moffatts. This goes pretty well, except for the part where Bricriu changes some of Molly’s lyrics to reflect his own, True Neutral standpoint (“I’ve lived my life in Nexus time,” he/she sings at one point, slightly shifting a lyric from “In the Darkness”). Meanwhile, at a repair station, the show focuses on a repairman working on fixing the bus after Ned nearly crashes it dodging Bricriu (whom he mistakes for the light off a motorcycle, or possibly a reflection). This man, Tom Martinez, turns out to have previously been a fireman in Hope Springs, and was on the scene of Rick’s car crash. Yeah, this episode is called “Destiny,” but like most stories that try to use the concept of fate as thematic material, it doesn’t all hold together. To make matters worse, Tom is having visions of his death, which is set rather poetically in a burning building. The stories start to intersect when Fi finds out about Molly’s directive to Jack to keep Fi away from Tom. Because Fi is just that sort of person, she goes directly towards the fire, er, Tom, and asks about his vision. But Bricriu/Molly stops her and promises to make Tom’s vision a reality if he ever goes near Fi again. Fi has by now figured out that Bricriu isn’t actually here to protect Molly, but to keep Fi away from Tom. For fear of Fi finding out the truth about Rick’s car crash, Bricriu uses the Celtic rune of constraint to confine her to the hotel room until the show. 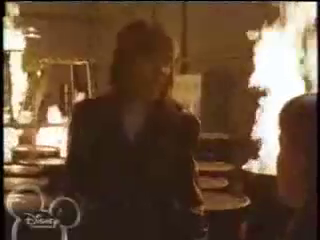 Martinez finally catches up to Fi at the show while the Moffatts are onstage, and the two talk about Rick’s crash—it transpires that Martinez was the one who pulled Rick out of the car—but Bricriu/Molly stops them again, sending Martinez fleeing into a warehouse suspiciously like the one in his vision. Fi goes after him and gets the truth at last: Rick was dead before the car crashed, his body cold and limp and lacking the usual injuries of impact. For her trouble, Bricriu sends the whole warehouse up in flames and talks some more about merry coincidence, namely that he caused the very thing he came to prevent. Also counted amongst these mix-ups and happenstances is the taking of Rick Phillips from the mortal realm before his time, which confirms what was implied by “Banshee.” (Remember, “it was not us who took him.”) And then he bounces, because in true Bricriu form, he prefers not to burn from within a mortal body. Fi convinces Tom to fight for his own life, and together they get Molly out of the burning building. Leaving aside the thematic nonsense and the question of whether or not Bricriu’s intrusion was successful for him, “Destiny,” while not as strong a mythology episode as “Strange Geometry,” places a subtle but important exclamation point on another implication that’s been growing since Fi escaped Bricriu the first time. The powers of darkness, who appear to hold lots of sway over the spirit world, are growing ever more fearful of Fiona’s investigations. By picking up the mystery of her father’s death, she has unwittingly stumbled onto the same dangerous road that led to her father’s death in the first place. The two are very much alike, as Molly confirms in “Fall,” and that similarity has driven a lot of the fear and uncertainty of the second season. A confrontation seems imminent, as does a return trip for Bricriu. But to what end? And will Disney Channel still be the same channel supporting So Weird when it finally happens? As Molly tells Fi in “Fall” about Rick’s own investigations, “some of it was cool… and some of it wasn’t so great.” Sounds about right. Cameron White is a freelance writer currently residing in Arkansas. He writes about television over on his blog, Wayward Television, and tweets about the fact that God’s gonna cut you down. His obsession with television was founded in 1996 by The Disney Channel and fostered by his discovery of Firefly in the summer of 2007. He don’t even have an opinion!